“The Cycle in the City, a BTC Fun Ride and Bikefest” is not a race. It is an occasion to celebrate cycling and the bicycle culture and an opportunity for bicycles to take over the Cebu city streets, and a sort of reunion of bicyclists of all shapes, sizes and ages and promote cycling as a way of life. 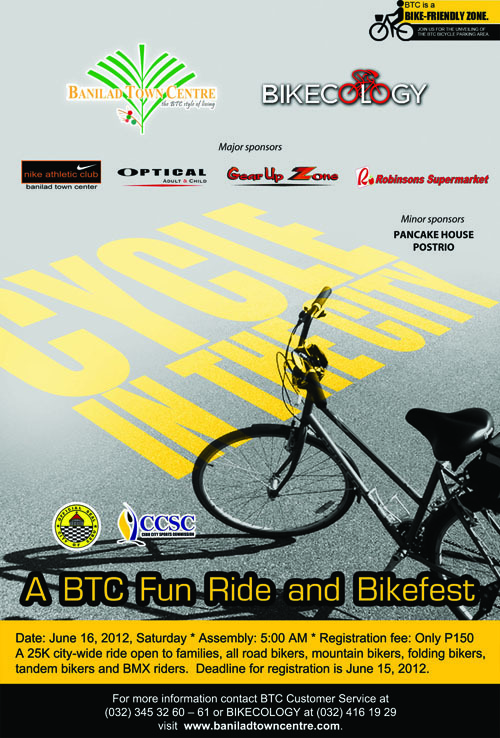 The Bike fest is set on June 16 Saturday, open to all at only P150 registration fee. Bikers and riders will gather at the BTC grounds at 5AM and starrt cycling the 25-kilometer city-wide ride by 6AM. Registration is now on-going at BIKECOLOGY. For more information, call Bikecology at Phone number 416 19 29. Deadline for registration is on Friday, June 15, 2012. Banilad Town Center is one of Cebu's bike-friendly zone, an unveiling of a bicycle parking area on BTC grounds await the riders and their family members after the race. Prizes will be given away to bikers or riders with Fancy Attire, Youngest Biker, Oldest Biker, Biggest Group/Contingent, and Vintage Bike Award. 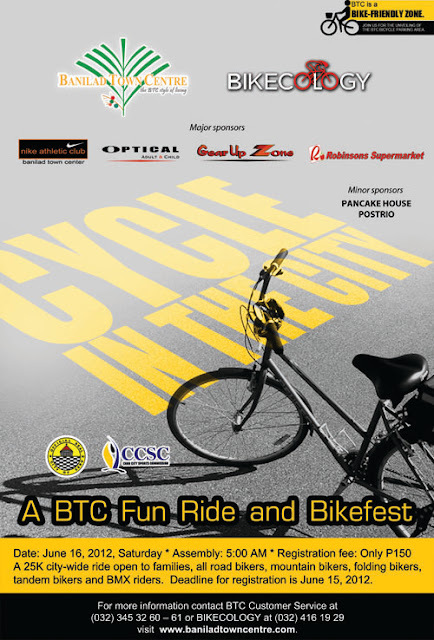 “Cycle in the City, a BTC Fun Ride and Bikefest” is co-presented by Bikecology. Made possible by Robinsons Supermarket, Nike Athletic Club, Gear Up Zone, Optical Adult & Child, Pancake House and Postrio and endorsed by the Cebu City Sports Commission. Banilad Town Centre (BTC) is located along Gov. Cuenco Ave. and is open everyday, for inquirues cal BTC Phone number or contact Customer Service at 032 345 32 60 – 61. 0 comments: on "Banilad Town Center Bikefest and Cycle in the City BTC Fun Ride"